This tutorial provides you with adequate knowledge in integrating your purchased SSL. STEP-1: Normally, SSL integration involves two entities. The first entity is the Certificate from an SSL Cert Authority; the second entity is a Dedicated IP, which can be purchased from any Hosting Service Provider. STEP-2: We assume you have purchased your SSL Certificate and your Dedicated IP. STEP-3 to STEP-7 will explain how to obtain an SSL Certificate (but without usage capability yet), while STEP-8 and STEP-9 will explain how to obtain a Dedicated IP so that the SSL Certificate will have capability to be used. STEP-3: Your SSL vendor will request two things from you: (1.) Primary Key for the certificate and (2.) Certificate Signing Request (CSR). The Figure-1 below shows how to access these two things from your cPanel. Figure-1. Accessing SSL parameters from cPanel. STEP-4: Your Primary Key can be generated from your domain's hosting cPanel. STEP-5: Your Certificate Signing Request (CSR) can be generated from your domain's hosting cPanel. Figure-2. 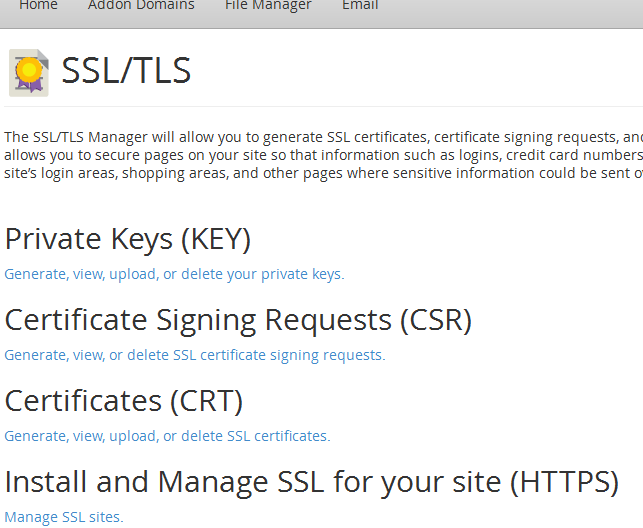 SSL Parameters in cPanel. STEP-6: Once your SSL vendor receives these details of STEP-4 & STEP-5 above, then this will enable your SSL Certificate to be configured. Once done from the vendor's end, then your certificate is closest to being generated. STEP-7: Your SSL vendor will then send the configured Certificate to the SSL Cert Authority. The SSL Cert authority will then forward the Certificate to the email you have supplied during configuration in STEP-6. You will therefore need to install the Certificate into your hosting account for the domain, using the same interface as shown in Figure-2 above. STEP-8: Now that you have done with obtaining an SSL Certificate, this will not be able to be used unless a Dedicated IP is attached. You will need to attach your dedicated IP to the WHM panel so that it can appear in the IPs list. Attaching this is in conjunction with your Hosting Provider's system. 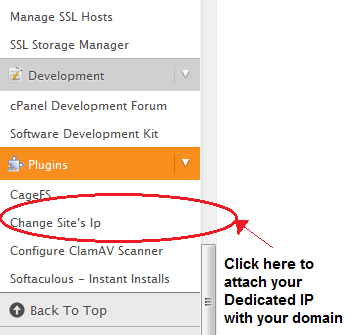 STEP-9: From your WHM's panel, find "Change Site IP's" link, under "Plugin". Click on it, and this action will generate all domains against all available IPs (both Dedicated and Shared). Figure-3. Attaching a Dedicated IP to a domain in WHM. Attach the domain (for which you intend to add the SSL) to the IP, and then click "Change IP" button. And that is all. Your domain can now be invoked using "https". However, due to network issues, invoking a domain with "https" may take some hours for propagation sake. You have now integrated an SSL to your website. Figure-4. An SSL enabled website's URL as displayed on the Internet Explorer's address bar.